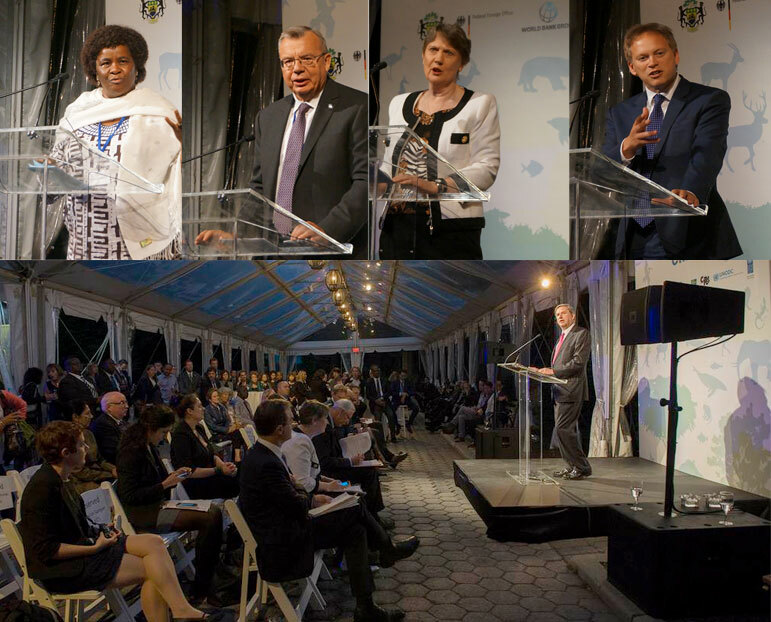 New York, 27 September 2015 – At an event hosted by the governments of Gabon and Germany and partners, leaders from U.N. member states and international organizations pledged their support today in tackling the growing problem of illegal wildlife trafficking at the Wildlife Conservation Society’s Central Park Zoo in New York City. Jointly organized by the United Nations Development Programme (UNDP), the United Nations Office on Drugs and Crime (UNODC), the Secretariat of the Convention on International Trade in Endangered Species of Wild Fauna and Flora (CITES), the World Bank, and WCS, the event was also attended by Ministers and other senior government representatives, NGOs, and others. It featured high-level remarks on the escalating threat of wildlife crime to the world’s wildlife and ecosystems and highlighted possible solutions for solving the crisis. The event coincides with the gathering of world leaders for the 70th Session of the United Nations General Assembly, which runs through October 6. The keynote speaker at the event, Helen Clark, UNDP Administrator, along with Ministers from Botswana, Gabon, Germany, South Africa, the United Kingdom, the U.S. Government, as well as the Executive Director of UNODC, and the CITES Secretary-General , discussed the need for increased political commitment in stopping wildlife trafficking and the need to increase financial and technical support. Speakers also noted the importance of a recently adopted UN General Assembly resolution on combating the illegal wildlife trade as well as a related outcome report titled “Transforming Our World: the 2030 Agenda for Sustainable Development” The report contains a number of Sustainable Development Goals (SDGs), which were formally adopted at the UN Sustainable Development Summit held from Sept. 25 through Sept. 27. The outcome document provides the world with a 15-year vision for guiding the protection of natural resources, including goals with targets for the conservation of wildlife and endangered species. It also includes specific targets to end poaching and trafficking of protected species of fauna and flora; to address supply and demand of illegal wildlife products; and enhance global support for efforts to combat poaching and trafficking of protected species by increasing the capacity of local communities to pursue sustainable livelihood opportunities. Other SDGs focus on stemming the effects of climate change, ending poverty, and conserving natural resources, etc. The event was moderated by John Scanlon, Secretary-General, CITES, with high-level remarks by Minister Issoze Ngondet, Gabon, Foreign Minister; The Rt Hon Grant Shapps, United Kingdom Minister of State for International Development and Minister of State for Foreign and Commonwealth Affairs; Hon. Edna Molewa, Minister of Environmental Affairs, Republic of South Africa; Hon. Tshekedi Khama, Minister of Environment, Wildlife and Tourism, Republic of Botswana; Anne Hall, Acting Principal Deputy Assistant Secretary, U.S. Department of State, Bureau of Oceans and International Environmental and Scientific Affairs; Cristian Samper, President and CEO, WCS; Georg Wilfried Schmidt, Regional Director for Sub-Saharan Africa and the Sahel of the German Federal Foreign Office; and Yury Fedotov, Executive Director, UNODC. CITES - With 181 Parties, CITES—the Convention on International Trade in Endangered Species of Wild Fauna and Flora— remains one of the world's most powerful legally binding tools for biodiversity conservation through the regulation of trade in wild fauna and flora. Thousands of species are internationally traded and used by people in their daily lives for food, housing, health care, ecotourism, cosmetics or fashion. CITES regulates international trade in over 35,000 species of plants and animals, including their products and derivatives, ensuring their survival in the wild with benefits for the livelihoods of local people and the global environment. The CITES permit system seeks to ensure that international trade in listed species is sustainable, legal and traceable. CITES was signed in Washington D.C. on 3 March 1973 and entered into force on 1 July 1975. Learn more about CITES by visiting www.cites.org. The United Nations Development Programme (UNDP) partners with people at all levels of society to help build nations that can withstand crisis, and drive and sustain the kind of growth that improves the quality of life for everyone. On the ground in more than 170 countries and territories, we offer global perspective and local insight to help empower lives and build resilient nations. www.undp.org. The United Nations Office on Drugs and Crime (UNODC) is a global leader in the fight against illicit drugs and transnational organized crime and the guardian of two key international instruments developed to address transnational organized criminal syndicates: the United Nations Convention against Corruption and the United Nations Convention against Transnational Organized Crime. To implement the mandate given to the Office by its two governing bodies – the Commission on Crime Prevention and Criminal Justice and the Commission on Narcotic Drugs – UNODC developed the Global Programme for Combating Wildlife and Forest Crime (GPWLFC). The GPWLFC is the framework under which UNODC delivers a range of technical assistance to Member States with the aim of improving their criminal justice and preventive capacity to address the illicit trafficking of wild fauna and flora. This technical assistance programme focus is geared towards strengthening and supporting the judiciary and prosecution, enhancing law enforcement capacity, legislative review, data compilation and analysis and alternative livelihoods to communities. For additional information visit https://www.unodc.org/unodc/en/wildlife-and-forest-crime/global-programme.html. WCS (Wildlife Conservation Society) MISSION: WCS saves wildlife and wild places worldwide through science, conservation action, education, and inspiring people to value nature. To achieve our mission, WCS, based at the Bronx Zoo, harnesses the power of its Global Conservation Program in more than 60 nations and in all the world’s oceans and its five wildlife parks in New York City, visited by 4 million people annually. WCS combines its expertise in the field, zoos, and aquarium to achieve its conservation mission. Visit: newsroom.wcs.org Follow: @WCSNewsroom. For more information: 347-840-1242. The World Bank Group is a vital source of financial and technical assistance to developing countries around the world. Its mission is to end extreme poverty and boost shared prosperity in a sustainable manner. Improving the management of natural assets is an integral part of that vision: by providing resources, sharing knowledge, building capacity and forging partnerships in the public and private sectors, we help set countries on clean, green pathways to growth, for resilient economies and healthy communities. The Bank plays a leading role in making conservation and development work hand in hand – it supports a global program of technical assistance on anti-money laundering, hosts a new Global Wildlife Program and works with countries to strengthen forest law enforcement and governance and combat wildlife crime.